January 28, 2016. Lots of folks back home have been asking Matthew and me if we’ve watched Occupied, a Norwegian television drama conceived by the famous Norwegian crime novelist, Jo Nesbø. Our answer is: Nope. Sadly, given that we only get Norwegian Netflix here, we can’t access the English subtitled version of the program. For those of you who haven’t heard of the drama, in short, it’s about what would happen if Russia invaded Norway to take over its oil production facilities. Norwegians have to decide whether they’ll collaborate, or resist. 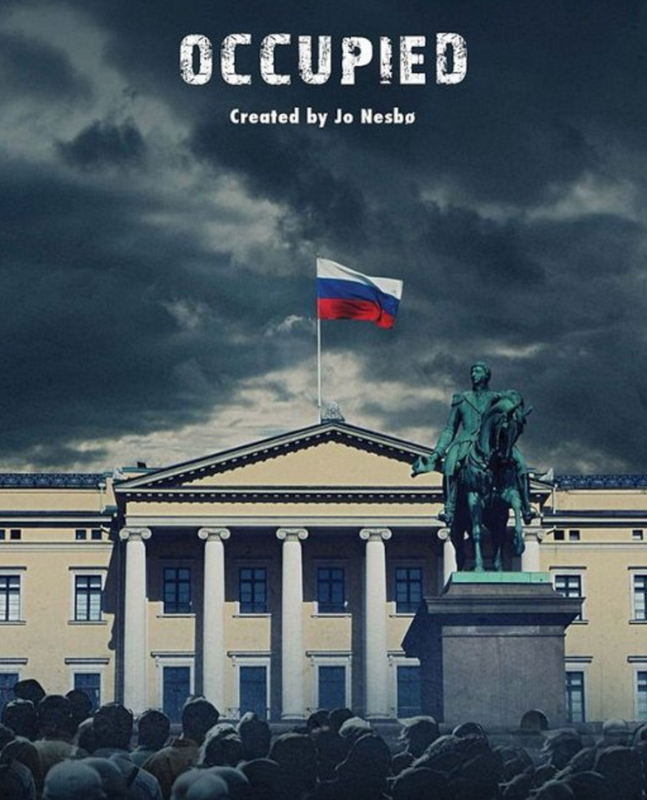 The English-language Netflix ad for “Occupied” (the word is “Okkupert” in Norwegian) shows the Russian flag flying over the Norwegian Royal Palace. While the storyline might seem farfetched, in light of recent activities in the Ukraine, the show has definitely touched a sore spot with Russia and given Scandinavians food for thought. I can’t debate the likelihood of such a scenario unfolding, but if it did, I’d put my money on most Norwegians becoming Freedom Fighters. Having just visited Norway’s Resistance Museum, I’d say that these are not a people who can sit idly by while their country is invaded and their government is overthrown. They may be quiet; they may be slow to anger; but they are not passive. 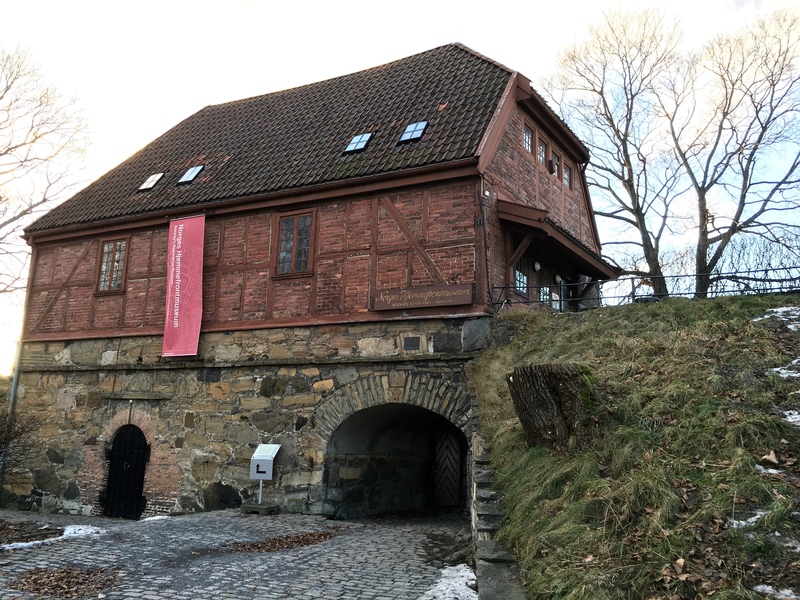 In 1970, Harald V, who was Crown Prince at the time, opened the Resistance Museum on the grounds of Akershus Fortress. Its first manager was Knut Haugland, one of the Norwegian commandos who pulled off WWII’s most successful sabotage efforts against the Nazis, described further below. Let me back up a bit. I’m not sure how many of you know Norway’s story during World War II. I certainly wasn’t very familiar it, beyond the standard history lesson categorizing the Scandinavian countries as neutral. But wow, is it an inspiring tale! (And one that has been turned into a made-for-Hollywood movie more than once … but I’ll get to that in a minute.) 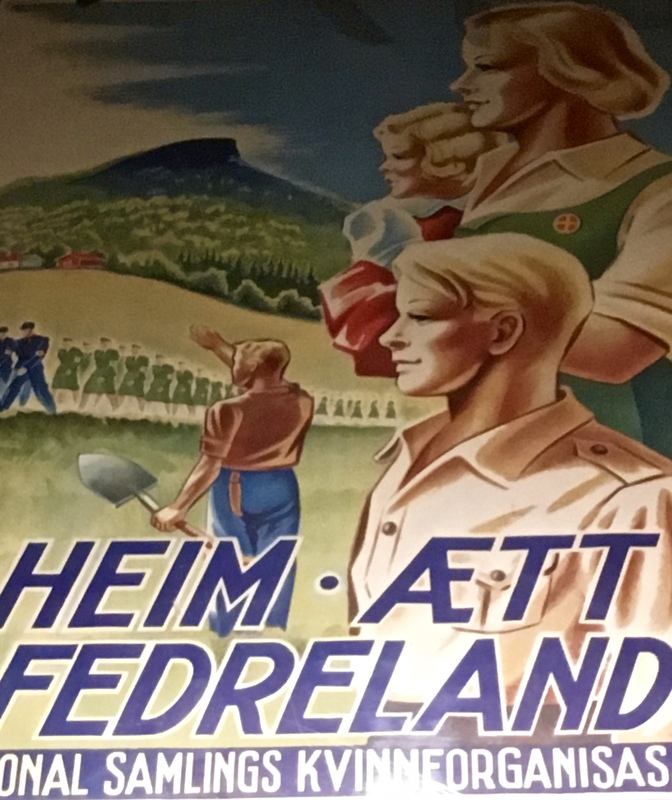 The tiny little Norges Hjemmefrontmuseum — Norway’s Homefront Museum, better known as the Resistance Museum — presents a whopping amount amount of information on the subject that packs a powerful emotional punch. 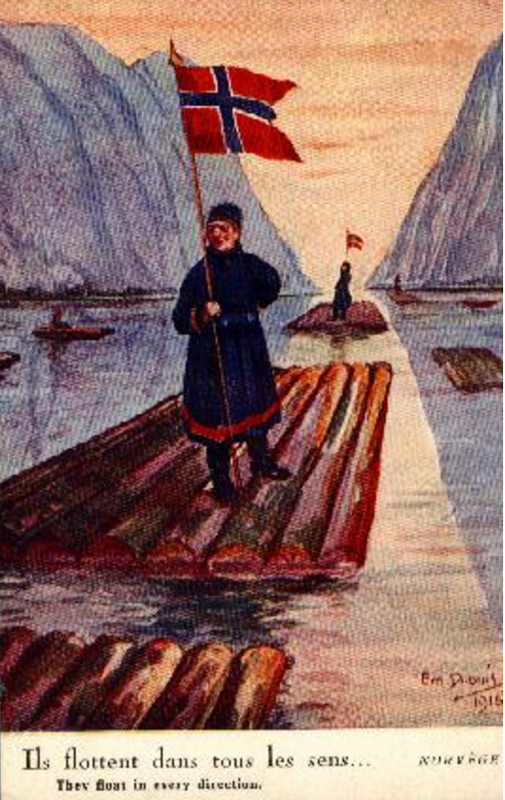 A WWI postcard designed by Emil Dupuis entitled “They float in every direction” shows the French belief that Norway didn’t know its own mind. In reality, Norway became known as the “The Neutral Ally” for its covert support of Britain, made stronger after Germany sank 847 Norwegian merchant ships during the war. To provide you with a bit of a backstory: Norway had just gained its independence from Sweden in 1905 when World War I broke out less than a decade later. Foreign policy wasn’t really a priority for a budding new country working hard to manage internal issues, so Norway elected to remain neutral — a position that was marginally respected and masterfully manipulated by both Britain and Germany throughout the war. Britain threatened to stop supplying Norway with vital coal if the country didn’t cease trade with Germany, while German subs took out Norway’s merchant fleet when their access to the nation’s vast stores of fish and valuable copper, nickel, and pyrite ore was cut off. The same scenario basically played out at the beginning of World War II. Norway declared neutrality again, hoping to avoid the financial strain of building up a military force. In response, Britain seeded Norway’s waters with mines and planned to invade the country to block German access to Sweden’s iron ores. But Germany jumped the gun and entered Norway before England in an attempt to secure its ice-free harbors and establish a “Germanic Empire.” And that’s why Norway ended up becoming the most heavily fortified country under Nazi rule, with almost 375,000 occupying German soldiers. 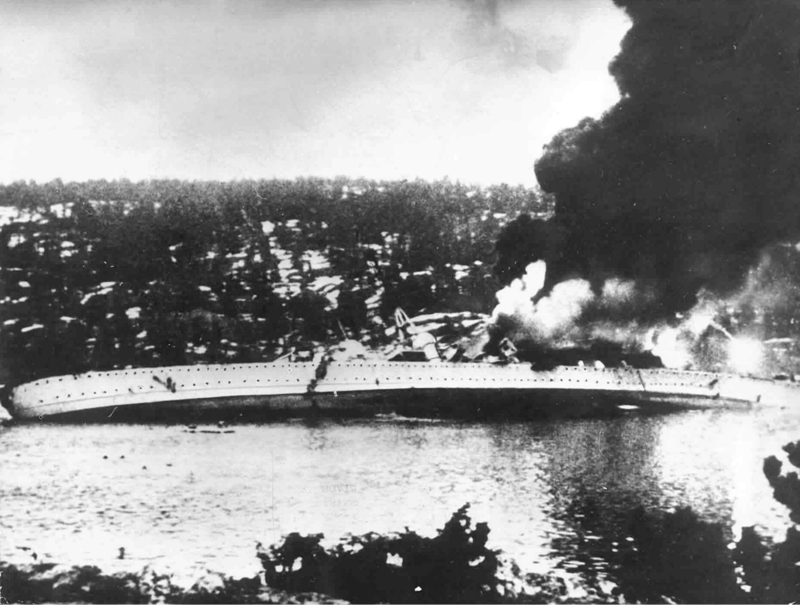 On April 9, 1940, Germany launched Operation Weserübung in a surprise dawn attack on Oslo and other Norwegian harbors. The Norwegian armed forces managed to take out the German cruiser Blücher seen here. King Haakon and the Government continued to move about Norway and organize internal opposition for two months — resisting German occupation longer than any other country except for Russia. They were eventually forced to retreat to Great Britain, where they created a Norwegian government in exile (something few other overthrown countries had been able to do). Vidkun Quisling was executed for treason at the end of WWII. To this day in Norway, the name Quisling is synonymous with “traitor.” Saying someone is a “Quisling” is much like calling someone a “Benedict Arnold” in the U.S. © The Norwegian National Archives. 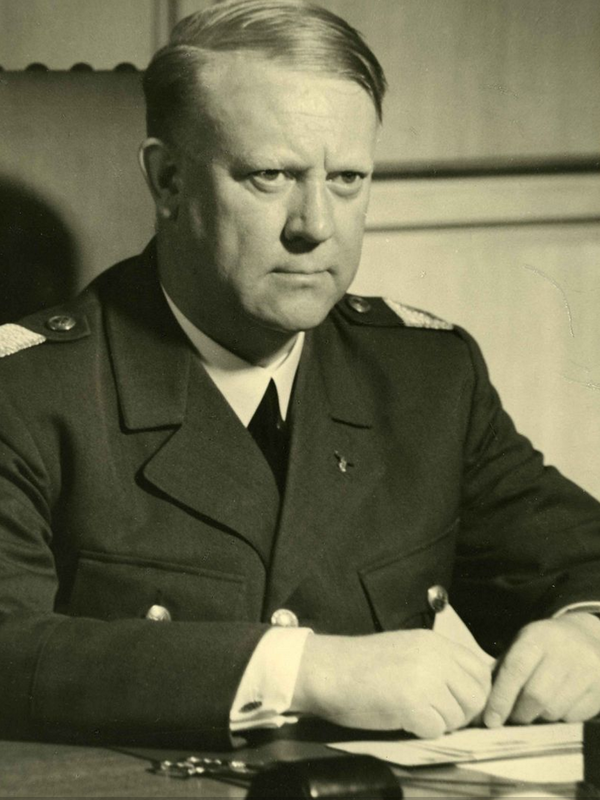 Robbed of its chance to control the Norwegian King and government in true puppet fashion, Germany grudgingly placed Vidkun Quisling, the leader of the unpopular Nasjonal Samling (the Norwegian fascist/nationalist party), in power. Quisling was an anti-semite and a wannabe Hitler cohort who saw Germany’s invasion as his “big chance.” Upon hearing of the Nazi fleet’s arrival in Oslo’s fjord, he attempted the world’s first-ever political coup via radio, declaring himself over the air waves to be the new “Prime Minister” of Norway. Despite propaganda like this ad for the Nasjonal Samling women’s organization, less than 2% of Norwegians joined Quisling’s fascist and eventually Nazi party. German Reich Commander Josef Terboven eventually decided to use Quisling and his puppet party to implement typical Nazi party-line ideals and politics. But the Norwegian people would have none of it. The entire Supreme Court resigned in protest of Nazi legal policies. Teachers chose prison camps in the Arctic Circle over teaching Nazi propaganda in school. Religious leaders suspended church services rather than support the Norwegian Nazi Party. Athletic organizations disbanded rather than tout Nazi rhetoric. Actors, singers, and musicians refused to take the stage in front of Nazi audiences. 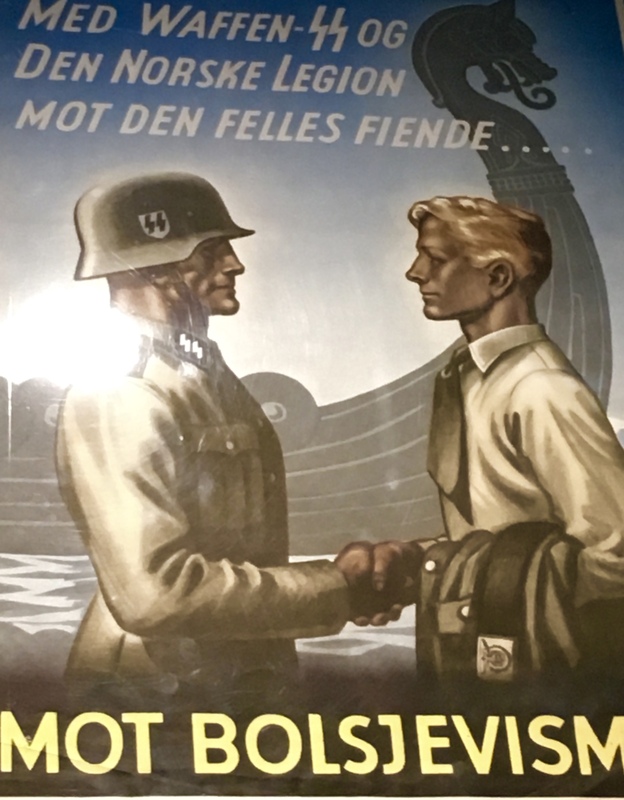 Nazi posters like this one fostered fears of a Communist takeover, promising that Germany and Norway could win against the common foe. (About 6,000 Norwegians joined the Nazis to fight on the Eastern Front.) Don’t you just love the Viking ship in the background subtly implying that the two countries are continuing a common ancestral tradition? In the end, around 50,000 Norwegians were sent to prison camps. One third of the Jewish population in Norway was exterminated. Only about 15,000 Norwegian men volunteered for the Nazi army, while 40,000 joined Milorg, the underground armed resistance movement. Outside Norway, about 28,000 countrymen and women enlisted in Norwegian units within Great Britain’s Allied military, where their movements were directed by King Haakon and Winston Churchill. The Hydrogen facility at the Norsk Hydroelectric plant manufactured heavy water (also known as Deuterium, or D2O.) Unlike regular water, Deuterium (which can also be written as 2H2O) has a hydrogen atom with one proton and one electron — an unusual nuclear structure useful in producing so-called hydrogen bombs. 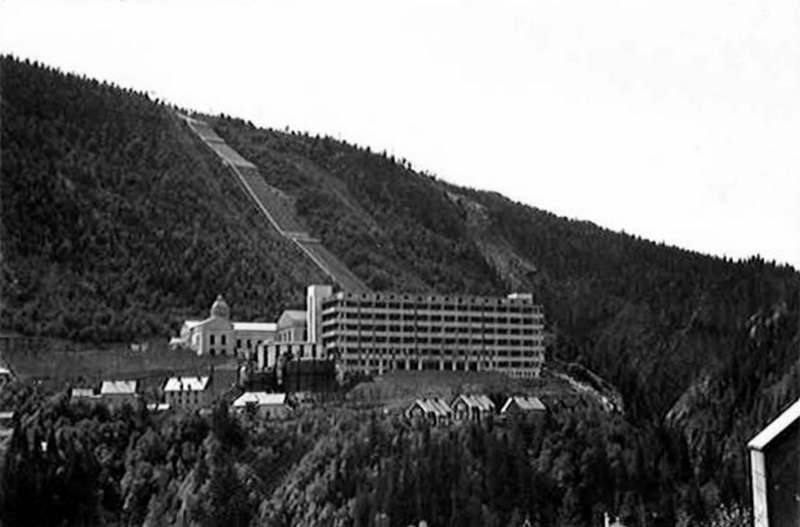 One of the most fascinating operations carried out by these exiled troops was the sabotage of the Norwegian heavy-water plant. To explain, heavy water can be used to develop nuclear weapons, and Norsk Hydro, by then under Nazi control, was the first commercial plant to produce heavy water as a byproduct of its fertilizer manufacturing process. The Allies became aware of the situation while working on their own atom bomb and devised a plan to beat the Germans to the finish line. 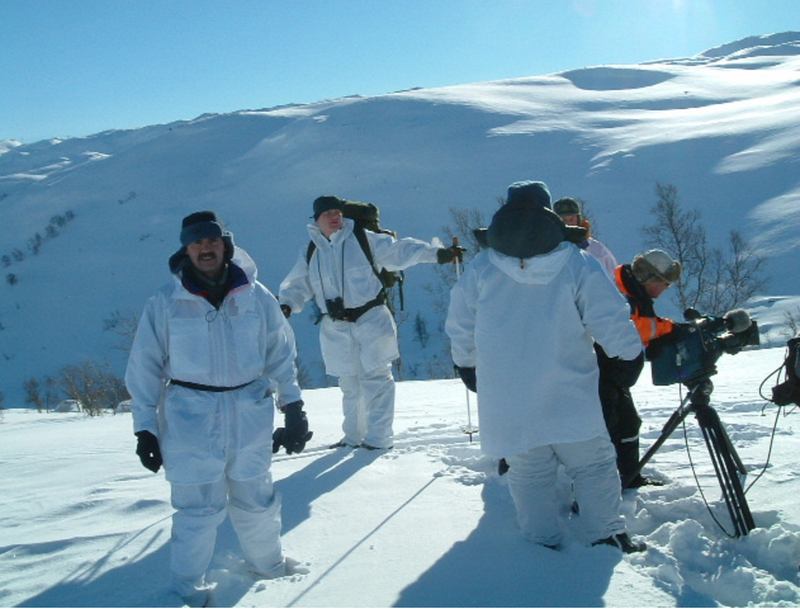 A shot from the BBC production “The Real Heroes of Telemark” shows harsh conditions on the Hardanger plateau and the re-enactment of survival skills practiced by the Norwegian commandos. That’s when things got really tough for the advance team trying to survive on the Hardanger Plateau above the heavy-water plant. The weather was now too rough for British aircraft to make the flight over the North Sea. Snowfall at its heaviest in almost 100 years, temperatures dropping well below normal, and their rations gone, the four Norwegians had to find a way to survive until their compatriots could join them and complete their mission. They holed up in a hytte (mountain hut), where they spent their days minimizing their movements to conserve energy and telling stories to keep from losing their minds. Reindeer moss became their only source of food, and their bodies went into starvation mode. By the end of two months, the men had each lost more than one third of their body weight. Finally right before Christmas, a herd of reindeer arrived, providing them with protein until Operation Gunnerland (Stage 3) could commence with the arrival of six more Norwegian commandos on February 27, 1943 — nearly five months after the initial team’s arrival. Despite increased German security, the Norwegian task force managed to sneak undetected into the Norsk Hydro facility. With the help of the plant’s Norwegian caretaker, the team set fuses that destroyed the entire inventory of heavy water (about half a ton) — all without a single loss of life. A British submachine gun had been left behind to direct suspicion away from the locals, but a search was made far and wide for the perpetrators. Six commandos escaped to Sweden on cross-country skis, while four remained behind. Hollywood produced its own highly fictionalized adaptation of the heavy-water sabotage story in 1966. Featuring Kirk Douglas, the movie still ranks as one of the top WWII films. 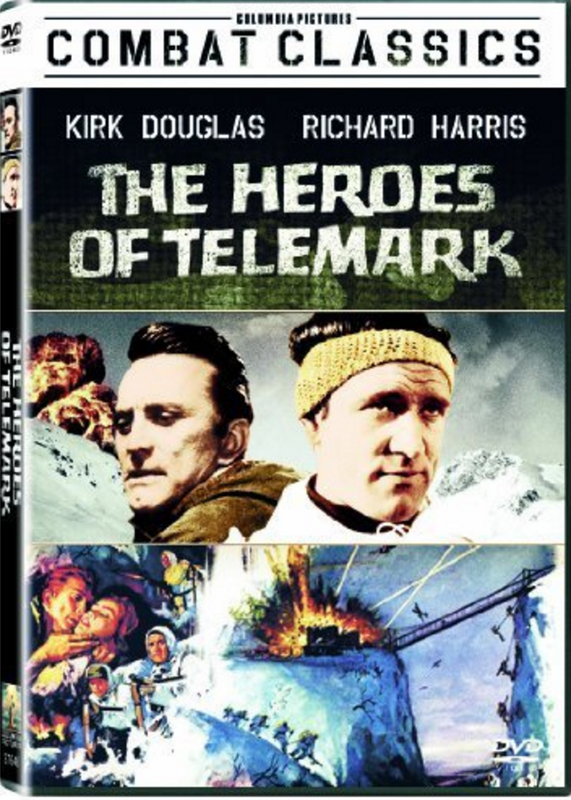 In the 2003 BBC production “The Real Heroes of Telemark,” one of these men tells an amazing story of being chased on skis for hours, while his pursuers dropped from four, to three, and eventually to just one stubborn Nazi who simply refused to give up. The Norwegian describes how this guy dominated on the downhill slopes, but he himself was faster on the uphill portions. Since the Norwegian knew the area intimately, he spent hours trying to ski up, and up, and up, until there was no more “up” available. Finally, at the top of the mountain range, he stopped, faced his pursuer, and drew his gun. Apparently, the determined but foolish Nazi had neglected to bring a weapon and turned tail to run. The Norwegian shot him and sped back downhill to take refuge in another hytte. It’s a shame the poor guy didn’t try that maneuver earlier and save himself some energy. In the end, the entire series of operations are considered the most successful acts of sabotage completed in WWII. 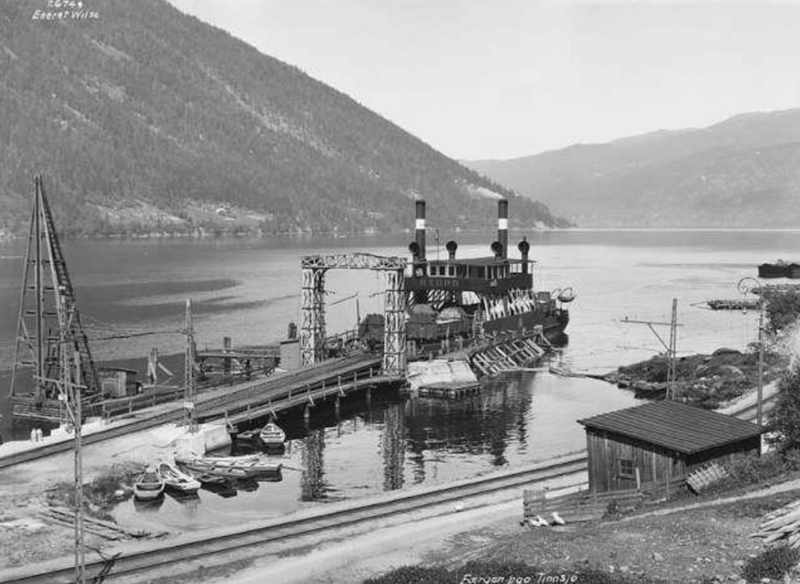 The SF Hydro Ferry at Mael in 1925, later destined to carry the heavy-water supply from the plant. But there’s a bittersweet ending to the tale. The plant re-started heavy water production shortly thereafter. The Allied air forces began a series of attacks that eventually convinced the Germans to stop production. However, at this point, the Nazis had accumulated another serious stash of heavy water, which they decided to ship to Germany where a nuclear facility was already in production. The single Norwegian commando remaining in the area came out of hiding one night while the cargo sat on a train, awaiting transfer to a ferry that would take the load across Lake Tinn. Surprisingly, the Germans had stationed all their troops around the train and cargo, but the ferry had no guards. The Norwegian commando managed to affix a series of charges to the ferry’s hull, timed so that they would detonate as the boat reached the deepest part of the lake. The plan came off like clockwork, and the cargo — as well as a number of civilian Norwegian passengers, who could not be warned of the situation without risking the plan’s success — sunk to the bottom of the lake. 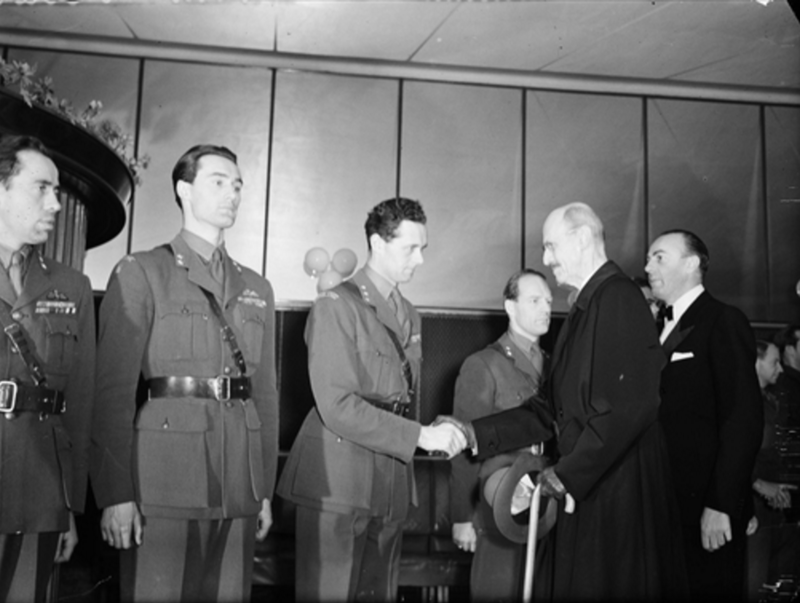 Pictured here are several of the successful saboteurs with King Haakon at the premier of the film, “The Heavy Water War” in 1948. Photo: Ørnelund, Leif / Oslo Museum. While the experts now hotly debate whether Germany was actually capable of building an atom bomb, the fact remains that this group of Norwegians took tremendous risks and endured incredible hardships to make sure it wouldn’t happen. And it seems to me that their actions, plus those of thousands of other men and women who fought for Norway’s freedom during the war, easily put to bed any question posed by Occupied that Norwegians will silently stand by during an invasion by a foreign power. That’s my opinion, anyway, for whatever it’s worth.